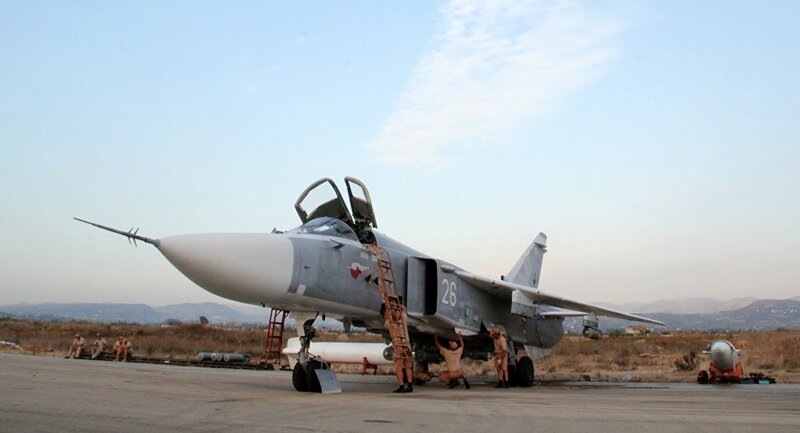 The Russian air force’s long-range striking power in the region comes from the twelve Su-24M2 Fencer jets that Russia has sent to its base in Latakia, Syria. The Fencer is a mature design as it was launched in the 1960s. But despite the age, Russia’s remaining fleet of Su-24s has been heavily upgraded with modern systems. The current version of the Fencer is equipped with GLONASS satellite navigation systems, an advanced glass cockpit, a modern head-up display and an upgraded air-to-air self-defense capability with the addition of R-73 high off-boresight missiles, American magazine The National Interest wrote. The Fencer can transport a maximum of 17,600lbs of ordnance, but usually carries only 6,600lbs in most configurations according to Sukhoi. The aircraft, which was designed to infiltrate enemy airspace at low altitude, can hit targets as far as 400 miles away without aerial refilling while carrying six 1,100lbs FAB-500M-62 bombs. According to the magazine, the aircrafts are being used not just for strike missions but also for reconnaissance and other support missions. As the magazine further speculated, considering that Russian air force has twelve Su-24M2 available to them, the Russian air force should have between eight to ten Fencers available to them at any given time. That means that Russian Forces can carry out thirty assaults per day in a best-case scenario. But it remains unknown as to how many pilots and maintenance crews Russian forces brought with them. “The Russian air force will eventually replace aircraft with the Su-34, but the Fencer will remain in service for some time to come. It still offers the Russian forces in Syria a decent long-range strike capability against targets that are further away from Latakia,” The National Interest concluded.